Till last post it was all preparation to install Exchange Server 2007 organization in the AD forest. What are next are the actual setup phases that Exchange Server 2007 installer runs through. Again, there are several changes made in the setup architecture compared to Exchange Server 2003 setup. Once you are through running the Exchange Server 2007 forest and domain preparation which is nothing but as good as running Exchange Server 2003 ForestPrep and DomainPrep but the terms used for these concepts have been changed completely. For Exchange Server 2007 setup they are called /PrepareShema and /PrepareAD. Along with these two setup switches Exchange Server 2007 offers a set of more switches which is described in http://technet.microsoft.com/en-us/library/aa997281(EXCHG.80).aspx rest of the switches available with the Exchange Server 2007 setup can be easily seen by simply running the command setup.com /? As explained in a previous posts “Installing Exchange Server 2003 (DomainPrep)” and “Installing Exchange Server 2003” Exchange Server 2007 also has to extend the Active Directory schema and also needs to setup permissions on different Active Directory containers in AD. We will take a look what all the changes happen after running setup with these switches. These new command line switches are /PrepareLegacyExchangePermissions, /PrepareSchema, /PrepareAD and few others with their functions during the setup phases. Remember, you need to have all the software prerequisites and AD prerequisites installed and configured correctly before you run any of the phases of Exchange Server 2007 setup, else the setup simply fails. Preparing permissions for legacy versions of Exchange servers. Creating Exchange containers in configuration naming context. Assigning permission to these containers created during the previous steps. To run all of these operations in just one shot without having much trouble setup facilitates the use of /PrepareAD but to run any of the above you need Enterprise administrator and Schema administrator groups memberships in Active Directory. Launching the Exchange 2007 setup in GUI mode does not ask you to run the AD preparation manually, it will do the /PrepareAD itself and then starts with rest of installation. in short, if you are installing the Exchange Server 2007 in a fresh AD then you really don’t need to bother about anything. Just go ahead and double click the setup.exe in the installation medium. 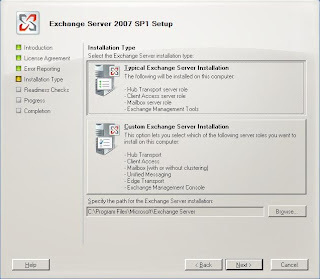 The very first screen of Exchange Server 2007 appears on the screen. Once skipped through first three steps of introduction, EULA and Error Reporting screens you will be prompted for selecting the installation type you want. The default installation type does not select the edge transport Server role for installation on the box where all other 4 roles are installed. Custom installation option is useful to choose while deploying advanced Exchange Server setup. As you can see in below figure it provides options to install clustered mailbox servers but the clustered mailbox Server role cannot have any other role installed on it. Setup will automatically gray out the options to select the other Server roles if either of the clustered mailbox Server options is selected. You can recall Exchange Server 2003 setup asked for the organization name as well. But it is during the binary installation phase. Till then it creates a child container for organization name under CN=Microsoft Exchange in config partition and leaves it without having a human understandable name. Exchange 2007 setup has a change in this plan as well. It will prompt you to enter the organization name before it starts running AD preparation. If you already have an Exchange Server 2003 organization running in your AD then the setup will never ask you to provide the organization name and you will never see that setup screen. The next screen asks to select a setting to let Exchange know if you are running a legacy outlook client in your organization. Here you can select the option accordingly. Selecting this option incorrectly will stop your outlook clients from displaying free/busy data to other users in the same organization. This is because outlook 2003 and earlier version query the Schedule+Free/Busy public folder on your Exchange Server 2003 to populate the free/busy data. However, Exchange Server 2007 no more stores this data in public folders. This data will be stored in the individual mailboxes now. But there is a catch on how other user would be able to see another user’s mailbox data unless he delegates the permissions to view his calendar to others. This task has been assigned to a new service introduced in Exchange Server 2007. This service is Availability Service. It will logon to the mailbox in picture, will fetch the information and then pass it over to the requestor. So if you still have outlook 2003 clients you should enable the support for them while installing Exchange. For more information on Availability Service you can refer http://technet.microsoft.com/en-us/library/bb232134.aspx . This article on Microsoft Technet describes the functionality of Availability Service. ed some more data by running more tools while Exchange Server 2007 setup is running on a Windows Server 2003 based computer so I will try to share all of those things in the next post as well. This entry was posted on 08/10/2008 at 5:11 AM	and is filed under Exchange Server 2007, Setup. You can follow any responses to this entry through the RSS 2.0 feed. Both comments and pings are currently closed.